Simplest, quickest, nutritionally-balanced meal that you can make by assembling ingredients that are readily available in your refrigerator. Feel bloated from an indulgent meal the day before? Not in the mood to cook an elaborate meal? Toss this salad, revel in its effortless goodness and thank me later! Up until few years ago, a salad to me was penance to a slice (or two) of cake or abstaining from an indulgent meal – I’d believe that eating a bowlful of salad greens first would magically undo the effects of a lifetime of unhealthy eating choices and unfavourable lifestyle. No more! As I began to implement healthier eating choices and forayed into my fitness journey, I realized that salads were often wrongly perceived as punishment! There is so much more to salads than merely sorry-looking vegetables piled together – vast possibilities exist in this area! You could add a wide variety of techniques like steaming/ sautéing/ marinating/ blanching/ curing etc to play with textures of the ingredients you wish to use. Also, it is possible to play around with seeds, nuts, grain flakes, legumes and even fruits to incorporate the crunchy/ nutty/ soft/ textures and the flavour profiles therein. 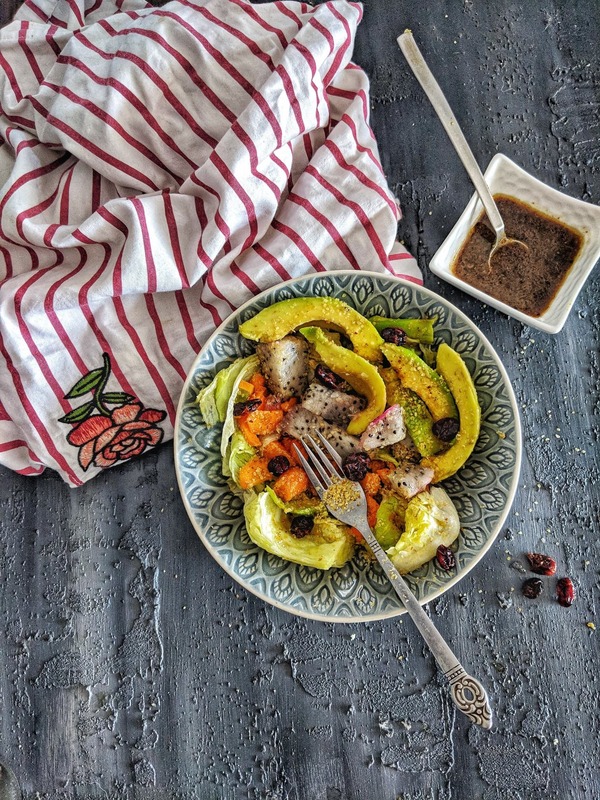 Let’s talk salad dressings, as it’s a whole world it itself – limitless options exist, depending upon your preferences and mood. Personally, I keep playing with simple vinaigrette/ jalapeno mayonnaise/ pepper/ lemon/ homemade hummus and tahini/ balsamic vinegar/ ranch sauce/ teriyaki/ thai sauces etc so there’s no scope for boredom. Check my Satay-style Thai Peanut Sauce too – I love how well it pairs with salad bowls! While at most times salads are meant to be a side option and paired with another snack or meal option, I sometimes try to make a salad a balanced meal in itself so no other meal is required. Add grains and pulses/ nuts and seeds/ legumes or even rice to make your salad wholesome and nutritionally balanced. Ready to take my word for it? Try my Chickpea Quinoa Feta Vegetable Salad with Lemony Tahini Dressing, Healthy Mango Panzanella Salad or Amaranth Peach Feta Walnut Salad to believe it! Whisk together balsamic vinegar, salt, extra virgin olive oil and Dijon mustard together to a paste. Add pepper, paprika and minced garlic. Add water or more oil to adjust the consistency for dressing. Set aside. Heat a non-stick pan and toast the sesame seeds for mild crunch. Set aside to cool. For making sesame meal, simply transfer the seeds to a mortar and grind coarsely with pestle. Combine all the ingredients in a salad bowl and toss well. Drizzle the dressing on top. *Recipe is for 3 servings; all values in grams.